Lof Yeupeko Filkun Once Again Repels Police Aggression. The media has informed on a new police failure in the area of Tres Cerros, where 60 Special Force Police (GOPE) and a group of intelligence officers of the National Chilean Police Force, searched the area for peñi [brother] Luis Tralcal Quidel, of the Yeupeko Filkun community. Despite using all the resources at their disposal, even using a helicopter to direct the raid from the sky, they were unable to find anyone. In fact, they were expulsed by Mapuche resistance organisms of the community. This would be the second failure by the police in their stubborn police persecution to Yeupeko Filkun. Fascist Chilean justice is searching for peñi [brother] Tralcal, for his alleged participation in the arson attack of forestry machinery in Chol Chol, at the end of 2006. A weak excuse for jailing those who carry out the more dignified and consequent Mapuche struggle. 1. The Chilean State, tirelessly harassing our Mapuche Nation and the organization the resists the forced extermination (CAM), began a new police persecution against our Lof [Community] Yeupeko - Filkun, on April 16th at exactly 4 pm. 2. 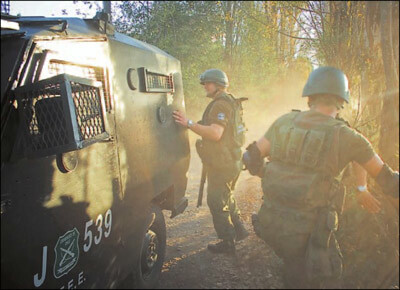 The new Mapuche hunt began less than a week after having detained 12 of our outstanding brothers, using more than 60 special force officers, anti-disturbance buses, armoured vehicles, war arms and a helicopter that closely flew over our community. 3. Unto the quick raid, the Yeupeko Resistance organisms decided to once again confront the military police repression, generating a new confrontation lasting approximately 10 minutes, having a second episode five minutes later in a second exchange of shots. Until finally, the police (Carabineros) decided to flee in their cars. 4. We would like to once again make clear that neither "terrorists" or "violent perpetrators" exist within our lands; on the contrary, they are just ordinary working people that decided to end the with the usurpation of historic lands, in the hands of a cast of agricultural estate owners (latifundistas). 5. With these events, it is clear to us that the Chilean State and its administration headed by Michelle Bachelet, is on the side of corporations and estate owners. Prioritizing its interest in maintaining the capitalist order, deeming it necessary to incarcerate, destroy and delegitimize the most advanced anti-capitalist expression of the Mapuche struggle that is the Arauco Malleco Coordinating Committee of Communities in Conflict, (CAM). 6. Lastly, this new raid does not scare nor intimidate us; on the contrary, it gives us more strength to continue advancing for our territory and national Mapuche liberation, when on January 13th 2001 we decided to tear down the fences of opulence of a few. Even up to this day, it has cost us persecutions, the torture of one of our community members, jail, political clandestinity, and the fall of our weichafe [warrior] in combat, Matias Catrileo, on January 3, 2008. For them, we will continue advancing, creating hope for the new generation of Mapuche to be born. IN MEMORY OF MATIAS CATRILEO! !